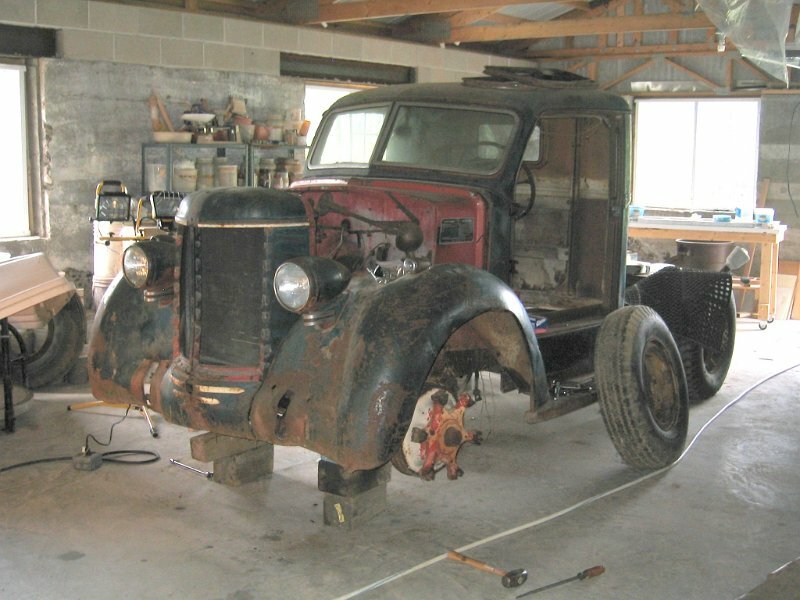 1 Old vehicles that are the objects of restorers desires are found in old barns, sheds or just rusting in a back field somewhere. In my case, my "find" was in my own garage. 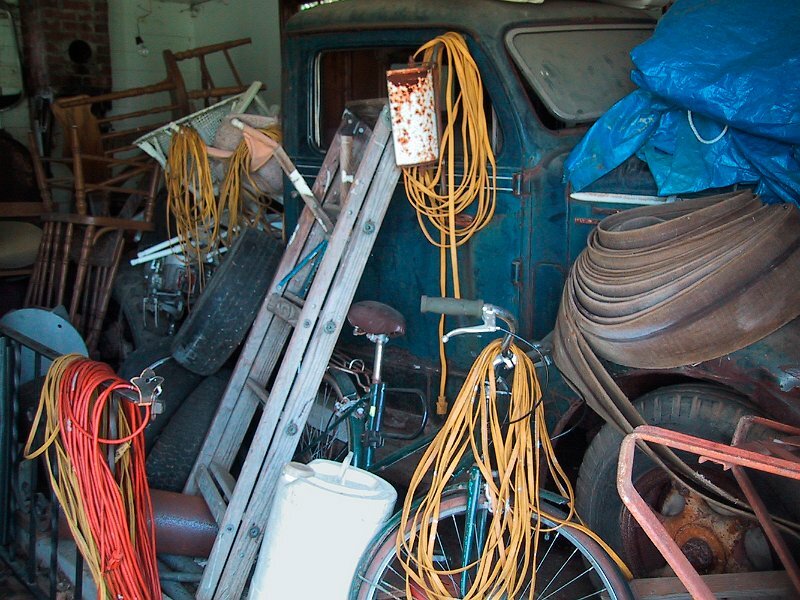 While the truck was stored in the old garage it accumulated a lot of odds and ends. The flat belt on the fender had driven my silo filler powered by a 1944 John Deere A. The extension cords came with the sailboat that I owned and restored and had been used by the former owner to run space heaters while a live-aboard in a boat storage yard. (See "Karelia" on the intro page.) The chairs have been repaired and now are in our dining area. 2 Here the truck has been cleared of its load of bikes, extension cords, ladders and stuff to get it ready to be moved into our newly reconstructed barn. The old barn had collapsed a few years before so we had the debris cleared out and burned. We put a new truss roof on the original concrete walls. I made new window frames and installed new barn sash that I had purchased years before but never got around to installing before the barn fell down. A photo slide show of the barn reconstruction can be seen here. 3 This picture shows me unhooking a tractor from the truck while moving it into the new space in the barn. I happened to be alone at the time so I had a chain threaded through a 2" pipe so I could pull the truck while keeping it from rolling into the tractor when heading down hill. I moved the truck a bit at a time until it headed off course. I then stopped and corrected its wayward wandering. 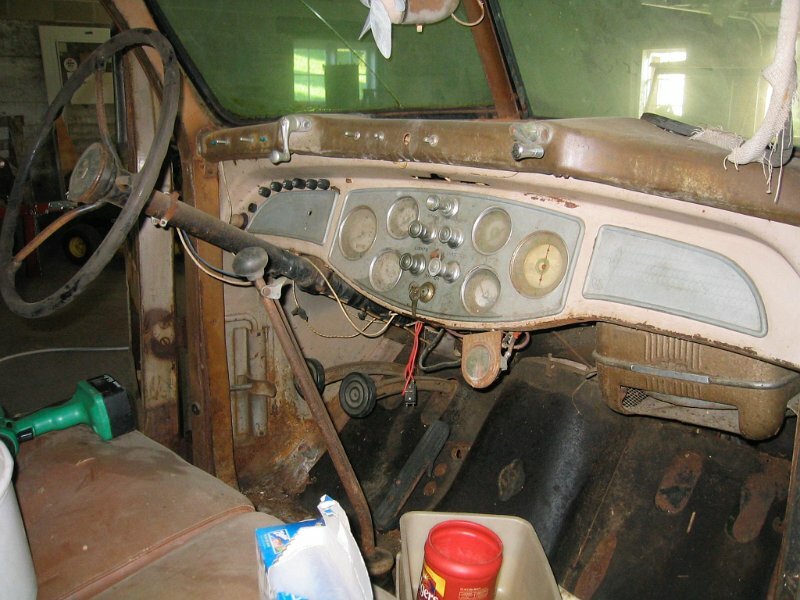 4 This is the way the dash looked when the restoration project began. On the left door frame, if you look closely, above the rubber disk, you can see two 1/2" holes drilled into the door frame. 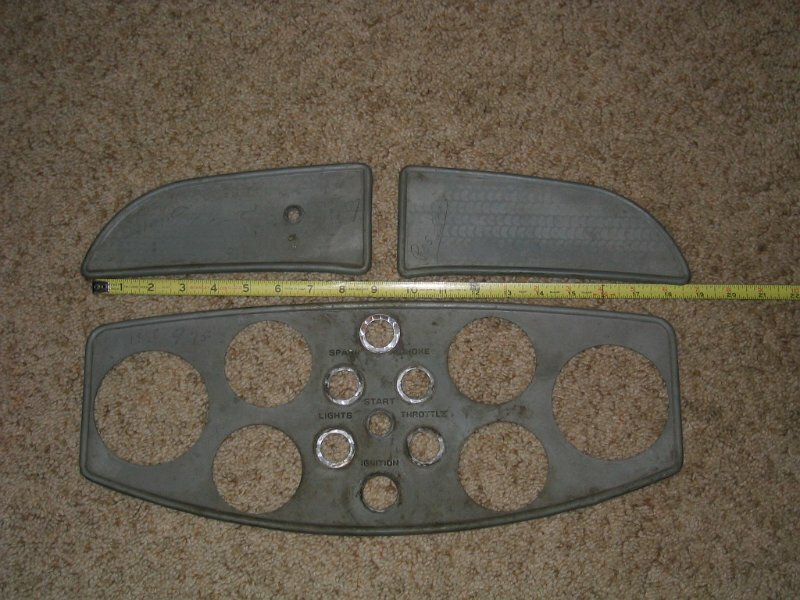 These were used to mount the control lever for the buck rake pictured on the intro page. The dash panel overlays were engine-turned die-cast zinc panels that had tarnished during the last 70 years. The truck had served as a tow-truck in its early years. Several unfortunate holes were drilled into the dash to mount switches and fuses for signal lights and rotating beacons and such. 5 The disassembly has begun. I used an acetylene torch to cut off the old non-original 3/8" steel plate bumper. 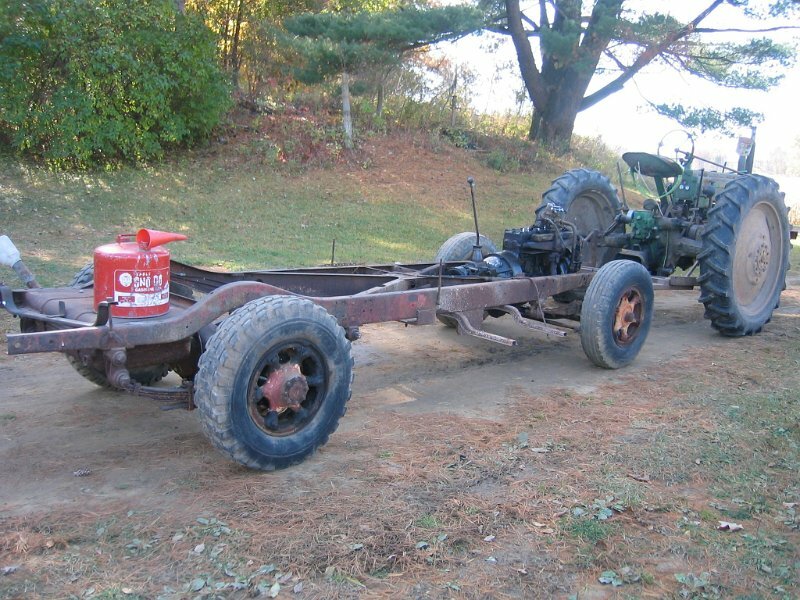 No doubt this was used when the truck served as a tow truck. I have an original replacement acquired from a fellow in California. The bumper was a bit of a disappointment when it arrived because it is dented and has a long crack that needs to be welded before it gets sent off to be polished and re-chromed. 6 Here the grill, hood and front wheels have been removed. This picture was taken before we partitioned off part of the barn to serve as an art studio for Sheila. The new area is well insulated and heated with a pellet stove. The three windows in the background are now in her studio. 7 Here the fenders have been removed. 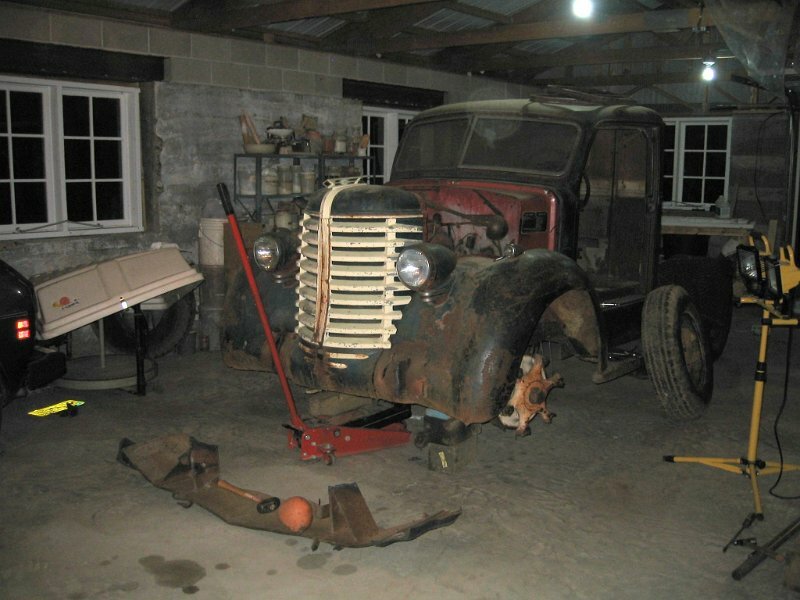 Almost all Diamond T trucks were painted red, the original color of this truck. 8 And now the radiator has been removed and sent off to a radiator shop to be reconditioned. 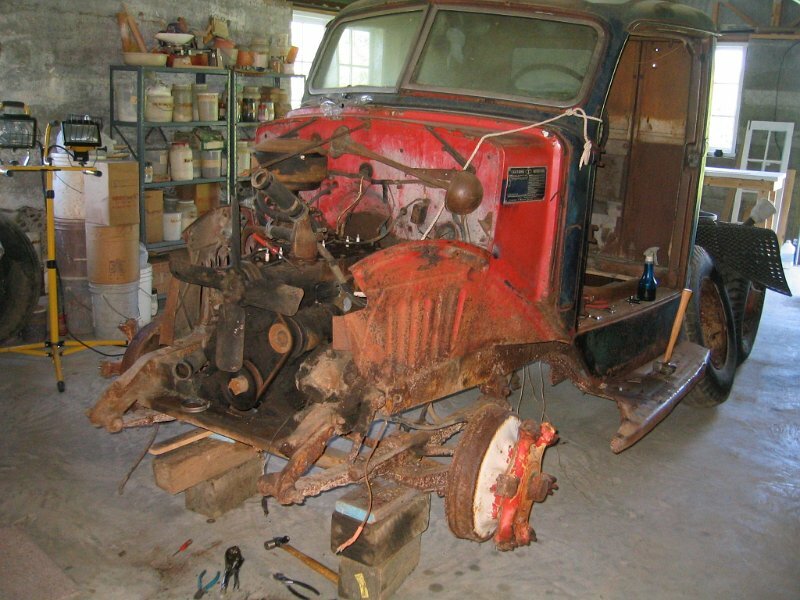 The shop reported that it was in good shape needing only minor repair and paint. 9 This is a view looking forward with the clutch and brake lever mounting bracket unbolted from the frame. 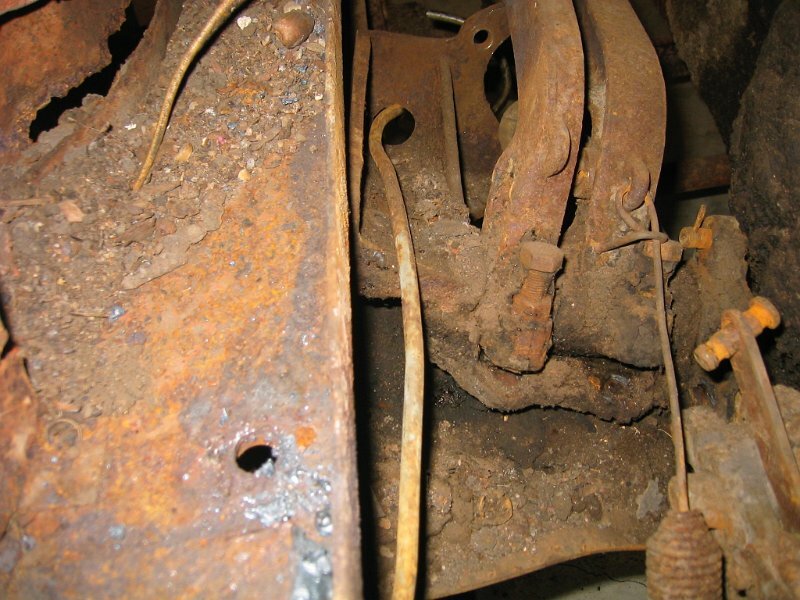 There is some rust through of the body sub-rail. The unappealing grime and scale along with the mouse droppings and acorn shells make this a pretty picture. 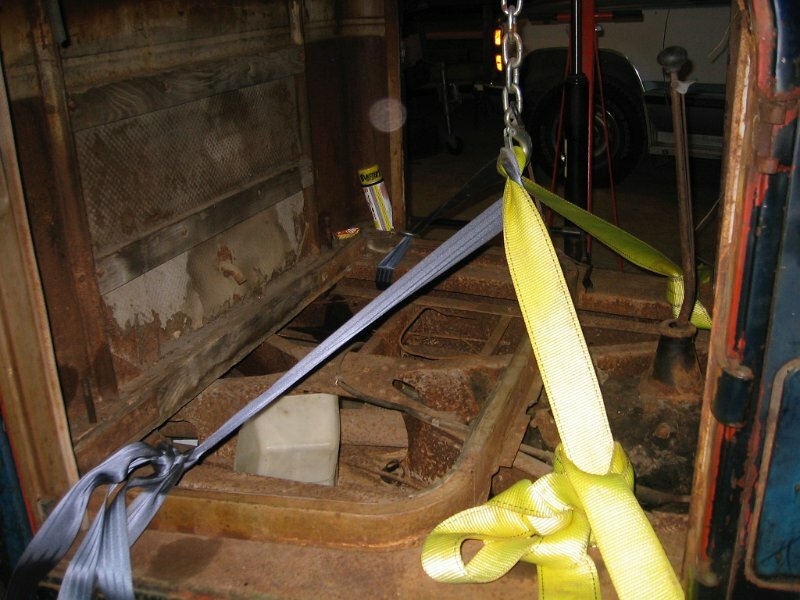 10 I used an engine hoist and straps to lift the cab off the frame. 11 With the cab removed the clean-up begins. Long years of sand and grit sticking to years and years of dried oil leaks made up a hardened compound just like asphalt paving. 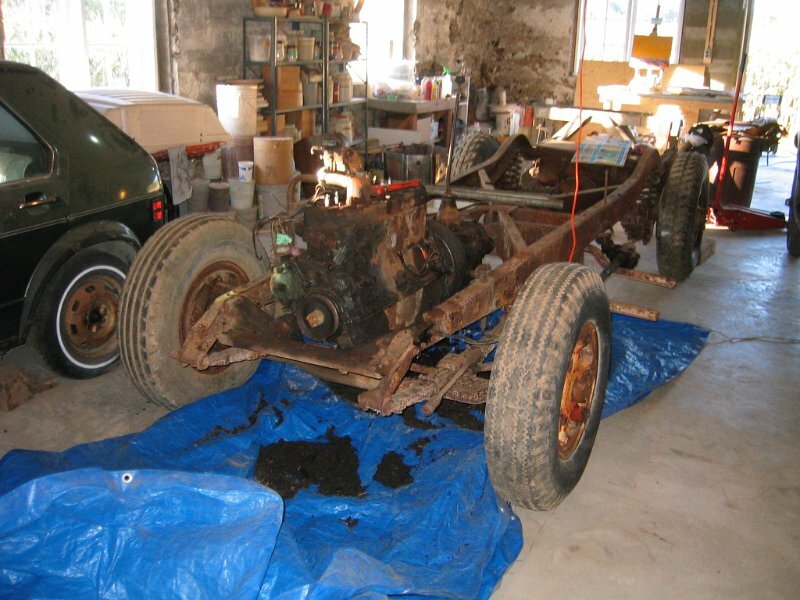 I think I must have removed at least 30 pounds of the stuff from the engine, transmission and frame. 12 Here the frame and engine are on their way to the house for a pressure wash with hot water. 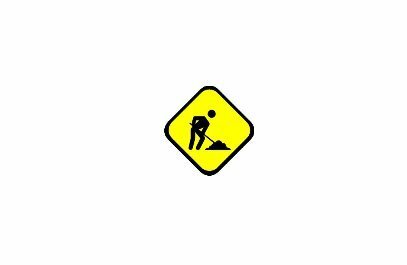 I had given the remaining grit a couple of spray treatments with kerosene to help loosen the remains of the "asphalt". 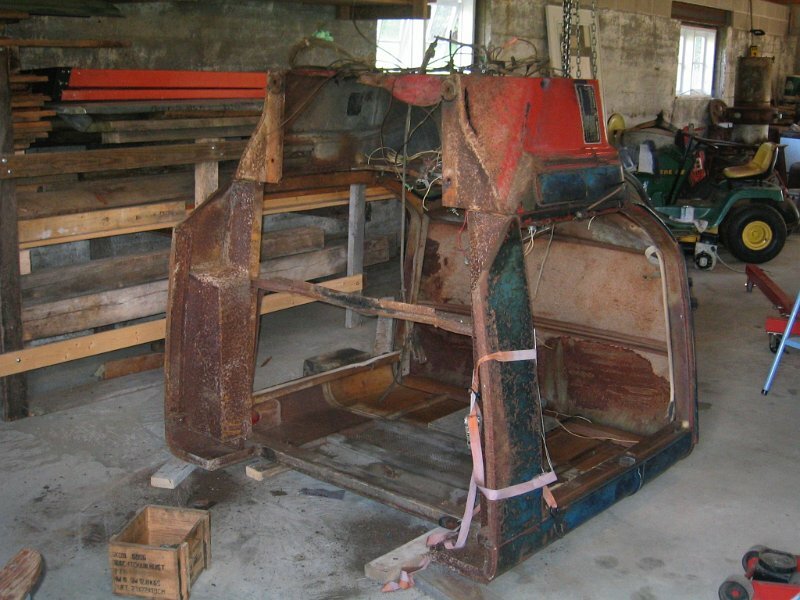 13 The cab is tipped on its back to make it easier to access the dash to remove the dash instruments for restoration. 14 These are the dash trim panels. They had been engine turned but had become so tarnished in 70 years that the original swirl pattern is hardly visible. 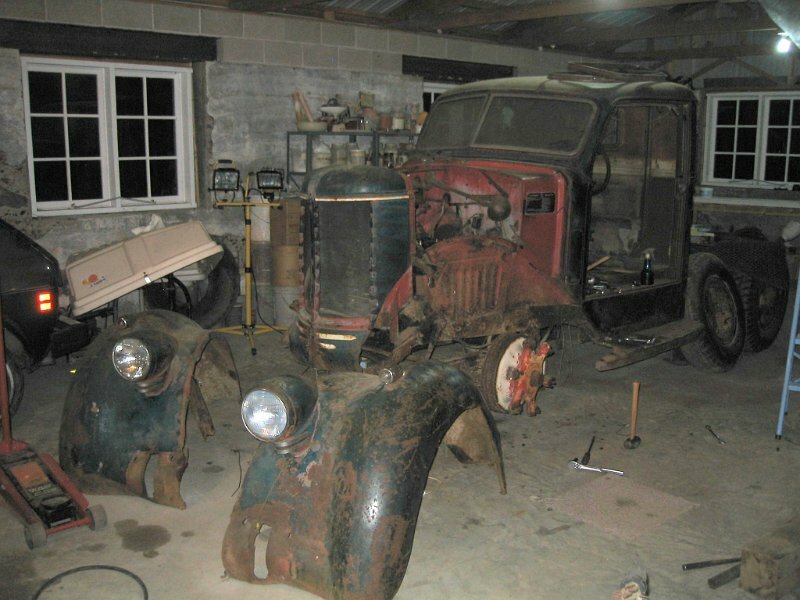 They have now been chrome plated and have been engine-turned by an expert at the almost lost art of engine-turning to recreate the original beauty. Recall the picture the cowling of the "Spirit of St. Louis" for an example of "engine turning". 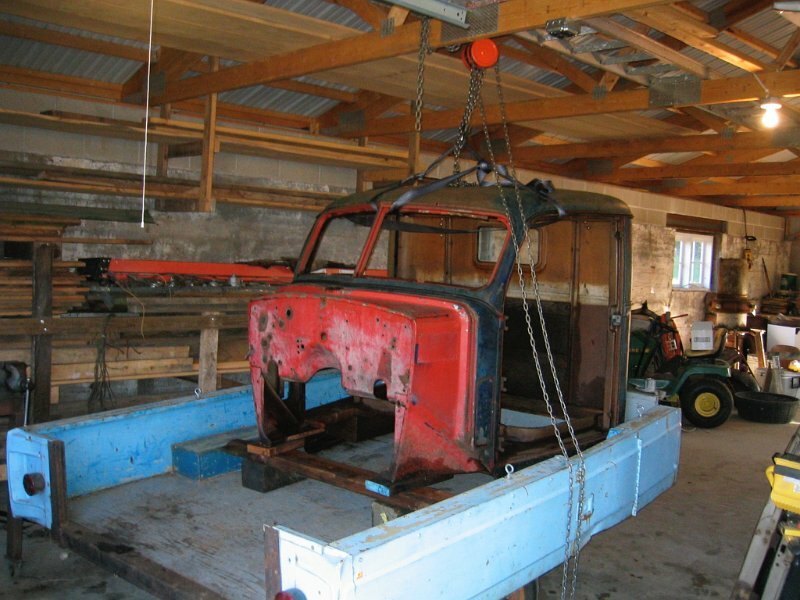 15 The cab is loaded onto a trailer to be taken, along with the rest of the body parts, to Cook MN where they were repaired and painted by "Dyke" Ongalo, the fellow that had done the body restoration on our 1930 Model A Ford. 16 Click to continue with Diamond T Reassembly .